Preheat the oven to 350 degrees F (180 C). Butter the sides and bottom of a 8x8 inch baking pan. Line the pan with parchment paper. 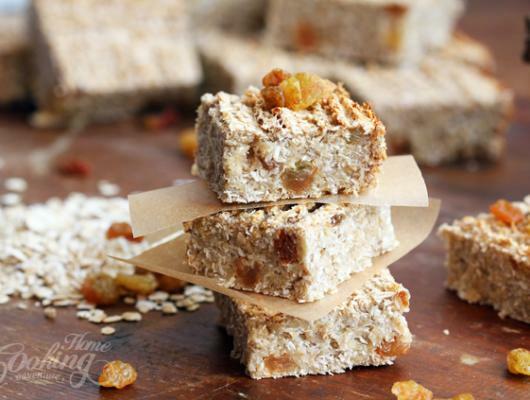 In a medium bowl combine rolled oats with coconut flakes and raisins. In a large bowl mash well the bananas. Add the grated apples and vanilla extract and stir well. Add the oats mixture and stir until well combined. Put the mixture into the prepared pan, press with the back of the spoon, makes shapes on top with a fork (optional) and bake for 30 minutes until the edges begin to crisp up. Place the baking pan on a a wire rack to cool. when is cool enough cut into bars and is ready to be served. 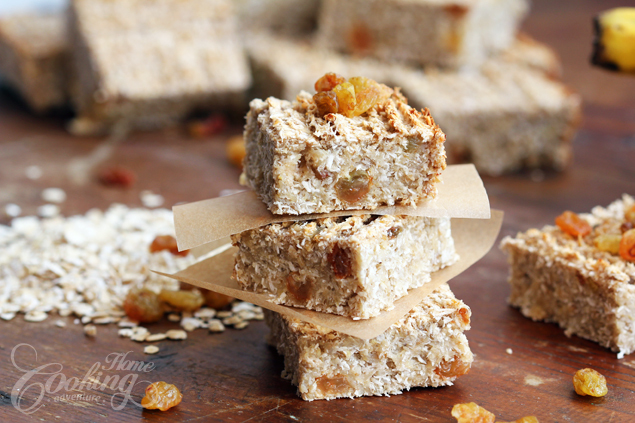 I am making these healthy energy bars for quite a while. I like to make them in the evening so that I have them for the next couple of mornings when I serve them along a good cup of coffee. The best part of these bars is that the mixture of bananas and apples holds everything together and there is no need to add sugar or butter. If you prefer you can only use bananas, by adding another two and no apple. These are just delicious, full of fibers, vitamins and minerals and are vegan too. You can add different dried fruits, or chocolate chips and have every time a different snack.